The fatal flaw of left-handed, creative polymaths, I’ve mentioned, is not finishing what we start. Today I’m following up last week’s post with how I prepared the eggplant and the radicchio bought a week ago at a Farmers’ Market while David and I visited Newport, Oregon. Just so you know, those beautiful vegetables did not meet their demise by rotting in my refrigerator. Wash and pat dry the eggplants after trimming away both ends on each, but leave the skins on. Slice each eggplant length-wise into four 1/2-inch slices. Brush both sides of each slice with the olive oil, and sprinkle with salt and fresh ground black pepper to taste. 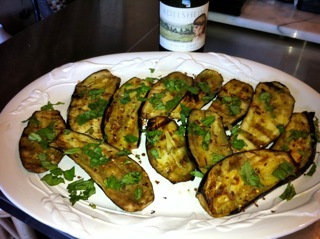 On a medium grill, cook eggplant slices until there are grill marks on each side, about 3-4 minutes per side. Don’t over cook. Arrange the slices on a platter and sprinkle with the fresh basil and crushed red pepper. Makes a dozen slices. The next day, I used the leftovers in Panini along with the heirloom tomatoes and fresh mozzarella cheese. Wash and pat dry the head of radicchio and the endive. Quarter the head of radicchio into wedges and brush the cut sides with the olive oil. Place the first oiled side onto a medium grill and lightly char the edges, then turn to the second cut side, and slightly char it too. Do not walk away from the grill while cooking the radicchio; they char quickly. Remove from grill, and set-aside until cool enough to handle with your fingers. Slice the endive length wise, then chop into 1/2 or 1-inch chunks. I like mine chunky, but I noticed David set the bigger pieces aside on his plate. I don’t think he knew what endive was until he met me. Put the chopped endive into a large bowl. Chop the cooled radicchio and add to the endive. Add the olive oil and balsamic vinegar; toss to coat and adjust to taste, along with the salt and pepper. Add the shredded Parmesan cheese and toss one more time. Pair with crusty bread, and a crisp Pinot Gris. This entry was posted in Nursing Lifestyles, Posts About Art & Nursing, Recipes and tagged art and nursing, cooking, grilled eggplant, grilled radicchio and endive salad, grilled vegetables, Newport Oregon, nurse blogs, Recipes, RN blogs, vegetable recipes by jparadisirn. Bookmark the permalink. Thank you Casey for clarifying the process. More reasons to love endive! Just a quick update. When the roots are first harvested, this is done by machine. Then, when the second growing phase takes place, the endive is handled by workers who are gloved and wearing hair nets, under very sanitary conditions. The link in my previous comment will show more about the whole process! I love the recipes on the Discover Endive blog! Thanks for bringing them to my attention. My readers should check it out. transfer in that manner too, or at least that’s what I learned in nursing school. If I’m wrong, please let me know. Second, if you’re grilling radicchio, try the same technique for grilling the endive. It’s very tasty, and might just result in a whole new taste sensation for your salad!